Phase Transformations and Material Instabilities in Solids contains the proceedings of an interdisciplinary conference on phase transitions and material instabilities in solids, conducted by the Mathematics Research Center of the University of Wisconsin-Madison on October 11-13, 1983 in Madison, Wisconsin. 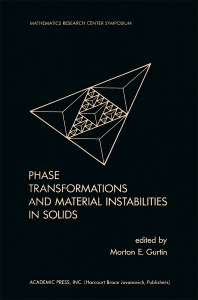 The papers explore phase transformations and material instabilities in solids and cover topics ranging from equilibrium shapes of surfaces to morphological instabilities and dendrite formation. Shock-induced phase transitions are also considered. Comprised of 11 chapters, this book begins with a discussion on material instabilities and the calculus of variations, followed by an analysis of mechanical analogs of coexistent phases. A model for the formation of shear bands in simple shear that involves the description of irreversible mechanical shear and the resulting heat release is then presented. Subsequent chapters focus on the Cauchy and Born hypotheses for crystals; the arrangement of coherent phases in a loaded body; one-dimensional shock layers in Korteweg fluids; and dynamics of first-order phase transitions. The final chapter deals with equilibrium shapes of surfaces and grain boundaries. This monograph will be of interest to students, practitioners, and researchers in mathematics and statistical physics.